Is life feeling especially restricted for you these days between certain areas of your life? And if your free-will is totally in-tune and the answer to that question is no, then we invite you to take another look around. Can you observe this theme of tension occurring for people you know in your life? What about the world at large? Most people would agree right now the world collectively is going through some pretty interesting changes, some appearing good- while others lean towards the negative and seemingly naturally disastrous. Personally, many are experiencing a sense of crisis some where within their current state of circumstances in life: albeit within their relationships, money, career, health, family, or personal fulfillment. We’ve never been closer to a point upon this planetary existence called Earth in a long while that will cause such a transformative affect to every living being some how, some way. Upon the days leading up to and surrounding 23 April 2014, there will be a surge of events, powerful circumstances and rather intense formation of situations within our world at large and our individual lives that will have the opportunity to be cleansed, released, and regenerated. It is time to say adios to the old ways we have become accustomed to, as we are all beckoned to surrender to change. There is a pattern of energy working hard between 4 different areas of our lives wishing to remove an existing structure that is worn out. What is already in motion, is a request to shift to a different space, in turn allowing us to never look back. This reflection is a result of 4 planets in their current transits above us within the Cardinal signs of leadership: those of Aries, Cancer, Libra, and Capricorn. People on earth who are born to these signs all tend to excel when they are in a position that allows them to be in charge of something. Each of these signs listed, have a planet journeying through them at present. The Grand Cardinal Cross is special because it is one of the more rare occurrences in astrology. While significant cycles in life are always happening all around us that we can witness within our outer world and our personal experiences- this alignment truly asks us to take notice of it. Each of the planets currently within the leaderships signs indicate particular areas of our life that are seeing the current courses of action significantly changing directions right now. What happens precisely from 20 April to the 23, is that these 4 particular planets all line up above to create 90-degree angles to one another, while equally the pairing of their 4 corners create 2 powerful oppositions. If you remember your geometry, four 90-degree angles equal and compose a 360-degree square. Giving a little 3D dimension to our picture, the corners of opposition create the alignment that looks just like a pyramid, with the 4 corners as its’ base. Now when you have 4 separate areas of life pushing and pulling against one another, this naturally can create a cornered and boxed in affect that certainly allows for extreme tensions to rise up from them. So high in fact that life can be found to be full of painful results and unhappy circumstances because resistance to the undeniable force of change is the typical reaction. However, if the planned response of surrendering to the old life that no longer works is adhered and committed to, those former painful results become successful future outcomes. The experiences we witness thereafter are yes, absolutely simpler, becoming ones that put a wonderful smile for the miles upon our faces. As we embrace a new foundation of cooperation that is ready for us to utilize as we recognize it fully- our success moving forward is completely unstoppable. Take a look at the chart above where it’s all spelled out for you. See how these planets are all “squared up” and precisely opposing one another at the 13th degree of the sign they are in? Here’s the very areas of our lives, where we can all take a look at our present circumstances and notice that we are seeing distinct patterns through our experiences here. Notice as well how these 13-degree points are equally creating a pyramid, as you view how the two oppositions occur simultaneously along with the 4 direct squares. Collectively, these planets ask us to see how their overall presence within the signs they are journeying in, wish to change the world in a positive way, rather than be fooled into believing everything is meant to be only tense and negative. Where is Your Grand Cardinal Cross Forming? Remember the Zodiac is sub divided into three different categories by task, or purpose (cardinal, fixed, mutable) and identified further through an elemental guidance (fire, earth, air, water). These pairings for any given sign brings forth a responsibility that they are pretty much innate at. 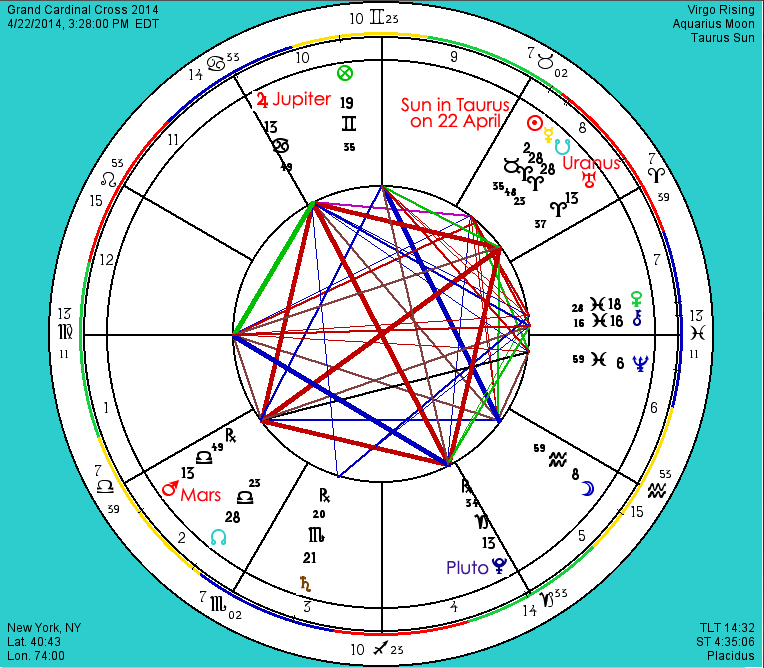 The Cardinal Signs (Leaders), naturally, are intensely being affected by the Grand Cardinal Cross, while the Fixed (Organizers) and Mutable (Communicators) will still experience immense change, but in different areas of their life. Below you’ll find your Sun Sign’s personal formula for the Grand Cardinal Cross as it will precisely fall over the dates leading up to and surrounding the most precise alignment upon 20 to 23 April 2014. Chaldean Numerology understands every compound (double digit) number has a significant association with it, known as a Chaldean Karmic Mystery. Part of the many leading changes we must surrender to, is to stop being so distracted by the technology our very world co-exists within. The 13 is all about innovations, but also the delicacy of power we must have with any of them. Humans by design, can simply not handle it and function optimally like they are innately supposed to. A lot of what the Mayans talked about with the coming of 21 December 2012, distinctly foretold there would be “too much energy” going on, and a shift back to simplicity is what will be necessary to prevail. Few really understand this, and they will continue to pay that price moving forward by remaining on overload within their lives. The key to our future is being responsible to simplicity- and not that we will live without our modern conveniences, but we must redefine our relationship to them. The capture of energy upon 20 to 23 April 2014, from the “as above” clearly asks for a new foundation to be formed between the leadership area within any of our lives “down here below.” See how the square also indicates the pyramid above it rising up when you see it in 3D. These 13 degree points of opposing and squaring off energies is the Chaldean’s numerological understanding of Regeneration – Change and within the Cardinal Leadership signs, it is the letting go of the old up till now to begin to build again a better understanding of how to lead with new life across the board for our future moving forward. Aside from the collective understanding of knowing your Sun Sign, you have one more layer of profound insight to deepen your self-knowledge by the critical view of how the Grand Cardinal Cross sits where all the 13 degree cardinal natal points align in your personal birth chart. When any astrologer asks for your full date of birth, time and place- this simple data casts your natal birth chart. Here in lies the much more intimate map we also wish to observe to really gain the specific ways that any current transit via astrology affects your life aside from just knowing your sun sign. Don’t have a natal birthchart? Check out Sharita Star Services because there is no time like the present to know what your birth chart can do to help you have more ease, feel empowered and reduce stress during the cycle of the Grand Cardinal Cross. To all the incredible discoveries that await you as an amazing new foundation is yours for the simple taking where you lead within your life Dear Stars.